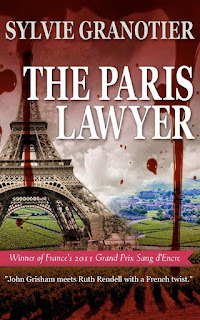 Here is my last Paris week post, a review of The Paris Lawyer - a mysterious thriller set both in Paris and also in the beautiful Creuse department, written in French by Sylvie Granotier and translated into English by Anne Trager of Le France Book. Young and ambitious lawyer Catherine is given her first major case and is desperate to prove herself to her boss. However Catherine has a troubled past, as a toddler she was the only other person present when her Mother was brutally murdered, a crime with no obvious motive and no conviction. Her father has never spoken of the trauma and she has spent her life struggling to get away from her past. But the past has a habit of catching up with you and she ends up coming face to face with hers – and it isn’t nice. The story twists and turns, the misery and pain of her childhood flashes back to her when she least expects it to, her life and the case she is working on seem full of lies and deceit and who to trust and believe is a tough call. How will she cope in court, will she discover the truth of her Mothers death and will her Father ever open up and talk about her Mother? It is a book with a lot of questions and a good read that keeps you interested and guessing until the end. The Paris Lawyer is available in Kindle format from Amazon. I hope you have enjoyed our week in Paris and I wish you all a happy and healthy Christmas and New Year. Thanks Jacqueline for this review. For other readers, the book is also available for Nook, Kobo and iBooks. Enjoy the read.